The Diablo Sandwich Toaster makes perfect circular toasted sandwiches every time. With unlimited ingredient combinations your snack sandwich is ready in eight minutes. The Diablo is perfect for a home made snack and it toasts most sandwiches in around eight minutes. The idea behind the Diablo sandwich toaster is simplicity itself. Place one piece of bread on the opened Diablo, pile it high with fillings of your choice, cover with another slice of bread then clamp the Diablo shut. Scrape off the excess bread and then cook on the oven top, barbecue or open fire for around four minutes each side. If it's not clear how to cook a Diablo toasted sandwich then go to the page here and click on the video for an example. I aim to post all items on the same working day of payment being received and I will send you an email confirming when the item has been posted. This is brand new, never been used, in the manufacturers original packaging with the recipe booklet included. 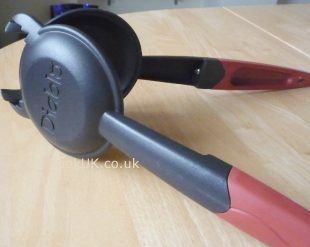 CookUK has been trading online for over five years. Our contact details can be found by clicking here. The metal end of the Diablo sandwich toaster is coated with a non-stick surface and that means nothing sticks to it. Washing up is simply a quick wipe with a soapy sponge or straight into the dishwasher. To be truthful though, we have cooked hundreds of toasties with the Diablo and it very rarely needs washing at all because nothing sticks to it. Click here for full technical product details of the Diablo Sandwich Toaster. Click here for our selection of DIABLO SANDWICH TOASTER RECIPES. The Diablo sandwich toaster can be used on gas, electric, ceramic, Aga cooker tops and is great for use on the barbecue as novelty snacks. Let your friends cook their own. The other perfect use is for camping when using Calor Gas. Even in the wilderness you can make the perfect toasted sandwich, wipe with a damp cloth to clean and the job is done. The list of ingredients you can use in your Diablo Sandwich Toaster is endless. Don't just stick to savoury ingredients though, it makes the perfect snack portion apple pie. Click here for our list of Diablo Sandwich Toaster recipes, all tried and tested at least twice with pictures to prove we really know what we are talking about. If you want to know how to separate the two halves of a Diablo or put it back together then click here for our Diablo Frequently Asked Questions page. 17 REVIEWS HAVE BEEN LEFT ABOUT THE DIABLO SANDWICH MAKER. I got one of these Diablo sandwich makers as an XMAS pressie and it's super. My master plan is to use it on the barbie when the summer eventually arrives! Wow! The Diablo Toaster is great and your recipe ideas for toasted sandwiches make it a real variety of ideas. Well recommended from me. Thanks, it arrived in perfect condition. Two toasties made so far and it toast them loooovely! Great piece of equipment. The problem with normal electric sandwich toasters is that they get so dirty so quickly. No one wants to clean them and they are left at the back of the cupboard. The Diablo hardly needs cleaning at all cos the non-stick works so well. Delivered in 48 hours - thanx. It really works! This makes awesome toasted sandwiches! Compared to electric sandwich makers the Diablo is so much easier to clean. And the recipes are excellent for ideas. I've made a toasted banana and peanut butter version and it tastes diveine! I've made lots of toasted sandwiches with the Diablo and they do taste good. Only criticism is they are the small side. I sometimes make one, and have another on the go when I'm eating the first one! The Diablo is now is my favourite. All the family love making these toasted sandwiches. They are so easy to make and turn out perfect every time. .
One of our caravanning friends recommended this to us and it's ideal for a snack in a few minutes. We use it at home as well. It's just so easy all round (excuse the pun). No mess because all the filling is sealed in, and so easy for cleaning. Make sure you stuff in as much filling as possible is my advice. Absolutely the best kitchen gadget I've ever bought!! It's so quick and easy, I buy small loaves so there's little bread wasted and it's so quick and easy. I made a snack earlier while I was emptying the dishwasher! Many thanks, my Diablo was received very quickly. Great product. I'll be spreading the word! 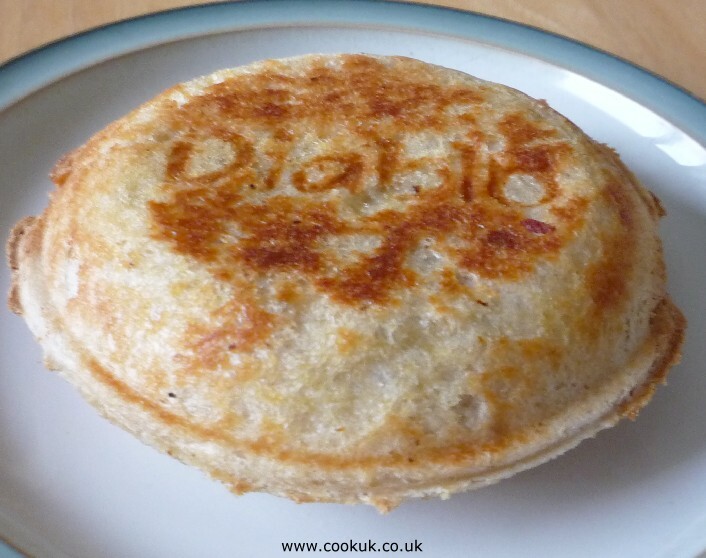 My search for a Diablo has double benefit as I've also been inspired to try a few recipes having looked at the whole Cook UK website which is just brilliant; and now bookmarked! Thanks for the fast delivery on my Diablo. I've made three toasted sandwiches already and they taste delicious. Thoroughly recommended and yes, it seems nothing sticks to it, not even cheese. ADD YOUR COMMENTS BELOW ABOUT THE DIABLO SANDWICH / SNACK MAKER. IT WILL BE ADDED ABOVE WITHIN 12 HOURS.